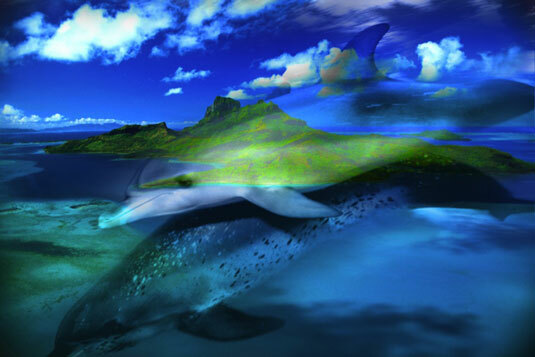 In Photoshop Elements, layers are essentially digital versions of clear acetate sheets. You can place elements, such as images, text, or shapes on separate layers and create a composite. You can hide, add, delete, or rearrange layers. You can adjust how opaque or transparent the element on the layer is. You can also add special effects and change how the colors interact between layers. Using layers in Photoshop Elements gives you tremendous flexibility when working with images. You can quickly make as many edits to your images as you want, as long as you keep your composite image in layers. Layers make working in Elements a lot more productive. 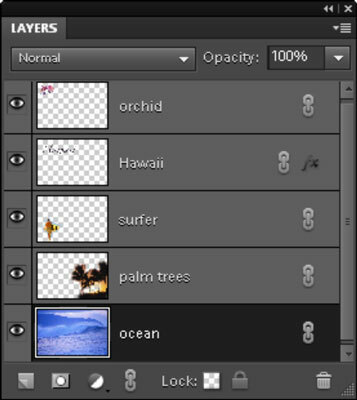 To work with layers, you must be in the Editor, in Edit Full mode. Layers enable you to easily create composite images. When you create a new file with background contents of white or a background color, scan an image into Elements, or open a file from a CD or your digital camera, you basically have a file with just a background. There are no layers yet. Choose Window→Layers to display the Layers panel. Double-click Background on the Layers panel. Or, choose Layer→New→Layer From Background. Name the layer or leave it at the default name of Layer 0. You can also adjust the blend mode and opacity of the layer in the New Layer dialog box. You can even do it via the Layers panel commands later. Elements converts your background into a layer, known also as an image layer. When you create a new image with transparent background contents, the image doesn’t contain a background but instead is created with a single layer. Elements keeps layers controlled with a panel named the Layers panel. To display the Layers panel, choose Window→Layers in the Editor in Edit Full mode. Select multiple noncontiguous layers. Ctrl-click (cmd-click on the Mac) your desired layers. View and hide layers. To hide a layer, click the eye icon for that layer so that the eye disappears. To redisplay the layer, click the blank space in the eye column. You can also hide all the layers except one by selecting your desired layer and Alt-clicking (Option-clicking on the Mac) the eye icon for that layer. Redisplay all layers by Alt-clicking (Option-clicking on the Mac) the eye icon again. Only layers that are visible are printed. Select the actual element (the nontransparent pixels) on the layer. Ctrl-click (cmd-click on the Mac) the layer’s thumbnail (not the name) on the panel. Create a new blank layer. Click the Create a New Layer icon at the bottom of the panel. Add a layer mask. Click the Add Layer Mask icon at the bottom of the panel. A layer mask enables you to selectively show and hide elements or adjustments on your layer. Create an adjustment layer. Click the Create Adjustment Layer icon at the bottom of the panel. Adjustment layers are special layers that modify contrast and color in your image. You can also add fill layers — layers containing color, gradients, or patterns — by using this command. Duplicate an existing layer. Drag the layer to the Create New Layer icon at the bottom of the panel. Adjust the interaction between colors on layers and adjust the transparency of layers. You can use the blend modes and the opacity options at the bottom of the panel to mix the colors between layers and adjust the transparency of the layers. This effect uses blend modes and opacity options. Link layers. Sometimes, you want your layers to stay grouped as a unit to make your editing tasks easier. If so, link your layers by selecting the layers on the panel and then clicking the Link layers icon at the bottom of the panel. A link icon appears to the right of the layer name. To remove the link, click the Link Layers icon again. Lock layers. Select your desired layer and then click one of the two lock icons at the bottom of the panel. The checkerboard square icon locks all transparent areas of your layers. This lock prevents you from painting or editing any transparent areas on the layers. To unlock the layer, simply click the icon again to toggle off the lock. By default, the background is locked and can’t be unlocked until you convert the background into a layer by choosing Layer→New→Background From Layer. Delete a layer. Drag it to the trash can icon.